As a concert band, the Rick Brunetto Big Band has been a part of Ohio’s living musical heritage since 1984. The band is considered one of the finest ensembles of its kind. While it has roots in historic American big band music, the orchestra plays concerts with selections of contemporary popular artists as well. Over the last 30 years, the band has performed all around Ohio, and travels occasionally nationwide to perform at festivals, weddings, concerts, corporate events, ceremonies, and carnivals. My name is Rick Brunetto, I am the leader of the Rick Brunetto Big Band. I brought this jazz orchestra to life 30 years ago as a means of preservation of the big band sound. Over a span of these years, the band performed countless shows, participated not only in traditional concerts, but also on stage performances, casinos, and gala nights. We play traditional tribute shows to classic American singers, but also perform shows with contemporary selections of funk, fusion, blues, rock and pop music. Of course a few new types of concerts are always under development. We would be glad to build a new selection to fit the theme for your special occasion or event. We know very well that no two concerts are the same. Different occasions and audience needs bring a different approach to make the music resonate with the listeners. We will work with you to learn about your event, your expectations and tailor the set list to fit your event profile needs. We will also discuss with you the technical aspect of the show, everything from stage size to lighting and special effects. Frank Sinatra was truly one of the greatest entertainers of our lifetime. Our tribute show features the spot on original arrangements from Nelson Riddle, Billy May, Neal Hefti and others. We will take you to the Sands Hotel in 1966 with Sinatra and Basie. Complete with a video montage of Sinatra’s life this show is a must see for Sinatra lovers. Relive the golden big band years of he 40’s as we take a journey back in time when swing was king. Miller, Dorsey, James, Kenton, Herman- it’s all there. Complete with singers dancers this show will recreate the magic of the fabulous era of big band swing. Along with nationally acclaimed tenor Elio Scaccio we have created a show that tributes some of the greatest singers the world has known including Lanza, Pavarotti, Caruso, Sinatra, Bennett, Daren, Groban and Bocelli. With lush orchestrations and a few tarantellas here in there this is a musical treat for not just Italians but all who just love great music. The music from the stage and cinema has produced some of the most enduring standards of the American song book. Our show highlights some of the greatest music themes of all time from Gone With The Wind to John Williams and beyond the magic of the movies comes alive big band style. Featuring our three fabulous singers and huge orchestrations the music of the cinema never sounded better. Our Patriotic Show has been a sure winner for 4th of July or Veterans Day. This special dramatic presentation features a reading of the Declaration of Independence set to music. Celebrate of the Christmas Season in big band style! The Most Wonderful Time of the Year is all about those holiday favorites presented by our 3 singers. New Years Eve, Dinner, Show & Dance. Our guest star is Deana Martin singing with the orchestra. We all danced to the soulful sounds of Motown. The Temps, The Supremes, Stevie, you remember all the hits. Motown never sounded better with the power of the 17-piece orchestra and our fabulous singers delivering those hits we all grew up with. Some of the most recent venues where the band played are Columbus Italian Festival, West Virginia Italian Festival, Ice Cream Festival at the Lakes, The Ohio State Fair, Buckeye Lake Concert, Upper Ohio Valley Italian Heritage Festival, Valley Dale Ballroom, St. Catherine Summer Fun Festival, Caesars Palace in Atlantic City, Opera Meets Big Band. 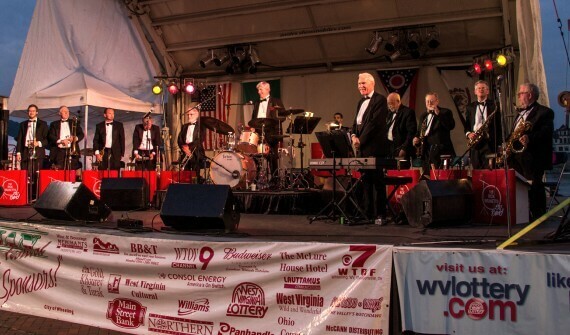 The Rick Brunetto Big Band is local to Columbus Ohio, so most of the shows they play is in the central Ohio region, but occasionally the band travels nationally to participate on bigger festivals and concerts. Check out our event calendar for the next performance. To get email alerts regarding our next or upcoming concerts, subscribe to our newsletter. You don’t need to wait to hear the band! Take the band home on a CD. Email Rick, and order “Tuxedo Junction”, “Pick Your Take”, “Stand Up and Swing”, and our latest CD “So Many Stars So many Dreams.” A new CD is coming soon! The best way to make sure you get it while it is still hot out from the studio, subscribe to our newsletter. From our base in Columbus, Ohio, we are available to travel anywhere in the continental United States. 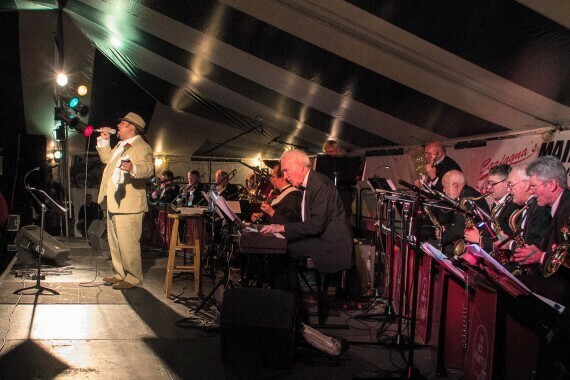 Call 614-419-5076 or contact us today to book the Rick Brunetto Big Band.